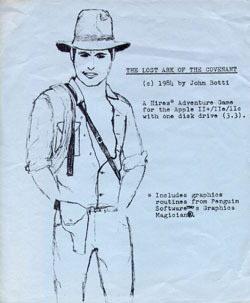 The Lost Ark of the Covenant is a relatively obscure Apple II adventure game, released in 1984 by Microscan. The game features very nice hi-resolution color graphics. The game is set in relatively modern times, and was influenced by the Indiana Jones series of movies. The player's objective is to recover the Lost Ark. The game is the work of John Botti, now CEO of Black Ops Entertainment. John explains: "I was in 7th grade when I sat in a dark movie theater and watched "Raiders of the Lost Ark." I was blown away by the movie, and fell in love with Indy's sense of 'adventure,' especially in the opening scenes in South America. I decided to write the game because I had just finished an adventure game called, "Sewer Adventure," which took place in the sewer systems of New York City. It ran on the Commodore PET and was text-only. I wanted to write a hi-res graphic game on the Apple, which had superior documentation, making it easier to write games for. I originally started writing the game in BASIC on the Apple, but quickly ran out of memory. The game was so big, and it was running on interpreted BASIC, that the memory clobbered the graphics pages (I believe each of the double-buffered pages were 2K each!). The scope of the game (about 3-4 times the size of "Sewer Adventure") prevented it from existing if it was written in BASIC. I had been taking a night course in Assembly Language at the local computer club. My twin brother Will had taught me a little 6502, so we took the class to try to better understand it. I used that knowledge to train myself on the 6502, then spent the next summer re-writing the entire game in 6502 Assembly language - I was about 14 years old. Due to the re-write, being an honors-student, running track and wrestling - it took me another 18 months to finish. Back then, I had no employees so I wrote all the code myself and did all the art. I placed small classified ads in magazines like CALL APPLE and others. I always put 'Dept CA' for example for the CALL APPLE ads, and tracked orders. If a magazine's classified ad wasn't generating enough money to cover the ad cost each month, I would go on to advertise elsewhere. At the end of the day, I believe I was running ads in 2-3 mags during my junior high/high school years." I asked John about his thoughts on the whole experience: "While the game took so long to make, and it never sold millions of units (needed more marketing), it taught me 6502 Assembler at a young age, which then made me capable of building a whole business applications software developer called Microscan (Microsoft was already taken! ), which is the second company I started in high school. By using the low-level, fast code I'd written for the adventure and video games, I was able to simply re-purpose the code to make business applications (like point-of-sale, inventory tracking, report card generation, etc) run really fast and efficiently. Interestingly enough, it was my early computer businesses that got me into MIT - I only had a B+/A- average, and didn't get into any other school. The night of my interview for MIT, I was prepping for a business presentation of some report card software I'd developed, and that and my businesses really impressed the interviewer. I got lucky - I got into MIT, then once there I got the keys to the MIT Media Lab in the first week because I got a research job. At the Media Lab I learned all about filmmaking, computer graphics, holography, production, editing, and more. It's amazing how the inspiration of an adventure movie can get an average kid into MIT! I still have a few boxes in storage I will go through one day. I have all my code written in composition notebooks, along with all my notes and designs. In those boxes somewhere is a letter I wrote to Steve Jobs, back in the day. I asked him if he had any advice for me as I was a young inspired entrepreneur. He actually wrote me back! I could not believe it. I was just a 14 year old, but I actually got a letter back signed by Steve Jobs that said, "We set our goals immeasurably high. And then worked like crazy to achieve them." It was short and sweet and to the point. But it really inspired me, getting a letter back from 'Steve'... And that's all I needed as a teenager to keep going in my little Long Island-based business." The game sold 10-12 copies a month for a few years, for a few hundred in total.